Aren’t monsters supposed to be scary? Scary? Sulley? That’s kind of hard to believe, isn’t it? Yeah, on paper, Sulley should be the scariest monster around. He’s got big claws, sharp teeth, crazy-looking horns. He can growl like a wild beast and he even has a scaring degree from Monsters University. In reality, he looks a little more like a giant fluff ball that you’d want to cuddle with at night. It’s no wonder that Boo fell in love with the big blue monster at the end of Monsters Inc., and that’s why it’s easy to fall in love with this Sulley Pajama costume too! 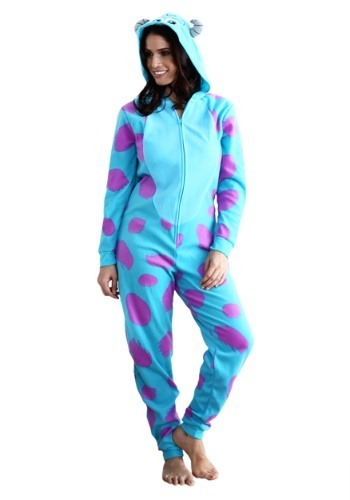 This women’s Sully Pajama costume is officially licensed from the Disney Pixar films and it’s designed to make you look like your favorite monster. The comfy jumpsuit is made out of a bright, turquoise fleece fabric that is ultra-soft to the touch. Purple spots dot the exterior to help recreate Sulley’s colorful look. It also has Sherpa fabric on the interior for added snuggly style. It has a zipper in front for easy fitting, letting you slip into this cozy piece in an instant. It also has a plush, stuffed tail attached to the back, but that’s not even the best part. The best part is the hood, which has embroidered details, like a pair of cartoon eyes, and a set of horns on the sides. This cozy outfit is the perfect way to cosplay as your favorite Disney character, but it also doubles as a cute and comfy way to gear up for movie night on the couch. Just slip it on, pop in your favorite Disney film and you’re in for the best night ever! You can even wear this to bed if you want to sleep soundly like a real monster at night!